This forecast is for UK GDP for the next two quarters and is based on for money entering the real economy that includes interest created money, the change in the levels of savings and changes to government spending and to a lesser extent the balance of trade. •	The money in the real economy increased for two of the three months of Q2 suggesting a GDP growth in the third quarter similar to that of the second quarter. •	Secured lending continued to increase accounting for 67.8% of lending in June up from 67.4% for the month before. Personal lending is also up but lending to businesses continues to fall in both percentage and volume terms. •	Based on the interest created from lending on property underlying inflation+ stands at 2.54% down from 3.46% for the same month last year. However other deflationary figures will reduce this including a low money supply due to low interest rates. Interest payments from June to July changed from £6,341m to £6,313m respectively. This represents a 0.29% increase to the money supply which is in line similar monthly increase over the last 12 months.. 64.87% of July's interest payment came from secured lending. Total lending (excluding that for financial services) for July has increased by £5.6b over the previous month. The level of savings decreased from £6,787m in June to £3,337m in July to. This represents a 0.88% increase over the last three months however over the last 12 month level of savings as a proportion of the economy as a whole remain unchanged. The balance of government spending (the difference between revenue and expenditure) decreased in July following an increased in the three month to June. 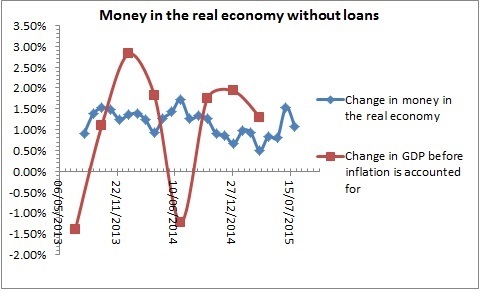 Money entering the real economy (from interest payments, changes to saving levels and the balance between government revenue and expenditure) increased over the last three months however because of a small changes to interest rates that actual amount of interest created money entering the economy is reduced. When combined with the fall in government spending there is a fall in the rate of growth in the money supply. Based on a 3 month lag between the money supply and GDP this fall should not manifest itself in the Q3 GDP figures but could affect the Q4 figures. Q3 GDP will be based on the money supply figures for March to June which showed a net growth and with inflation close to zero the one could expect a growth rate of close to 1%. Changes in economic activity or GDP before inflation is taken into account have been shown to be linked. 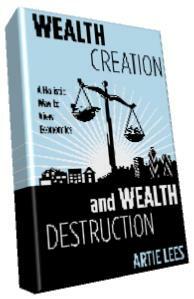 This link is argued in my book ' Wealth Creation and Wealth Destruction' and my forthcoming book 'An Interesting Theory'. Further analysis of the data shows that changes to GDP before inflation lags changes in the money supply to the real economy by approximately 3months. +Based on arguments made in my forthcoming book 'An Interesting Theory' underlining inflation is linked to the interest resulting to from lending on property. This may not manifest itself all as inflation as low interest rates are currently chocking the money supply such that it is used to grow the economy.